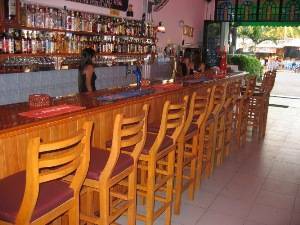 Sihanoukville ... Well what can i say ...All is good at the Kangaroo Kitchen, great place, great price an good food..O an a well stocked bar. Over all a quite pleasance stay for that time of the year...New Year. Kangaroo Kitchen invites you to experience a fantastic blend of Australian and Khmer hospitality. Our fully serviced guesthouse accommodation with hotel style rooms boasting Queen size beds with inner spring mattress, cable TV, Air conditioning or fan rooms, WiFi, wardrobe and separate ensuite with shower, toilet and hot water in our budget rooms. 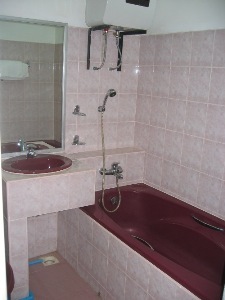 For the less budget conscious we have rooms with all the above and the added attraction of a bath. For the family, we also have two large suites each with two rooms capable of accommodating Mum, Dad and up to 4 kids. 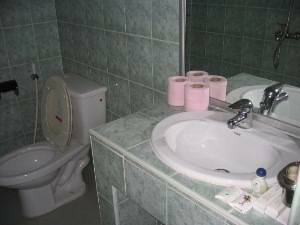 Room service is also available including laundry service. Our kitchen staff are capable of preparing excellent Western and Khmer/Asian foods from breakfast until very late at night. Please feel free to view our extensive menu. We are conveniently located right in town approx 100 metres from the existing bus station on Street 109 Sihanoukville, just look for the Aussie kangaroo. For your convenience we have motor bikes for hire and the added advantage of access to local Motodups and Tuk Tuks. If you choose to go to the beaches it will take just 5 minutes by any mode of transport you choose to reach any of the magnificent beaches on offer North or South of town. The local markets are an easy 10 minute stroll from where we are located on Street 109. For those of you looking for something different we also carry board and card games for you or the kids, just ask at reception. The management and staff of Kangaroo Kitchen wish you and your family a most memorable and enjoyable stay in our establishment and in the Kingdom of Cambodia. Is a wonderfull Beach town and port community, Known now as a world resort destination and described by many as Cambodia's premier beach town. Sihanoukville has wonderfull white sand beaches and warm waters of the Gulf of Thailand make it a nice place for swimming and playing in the water. Sihanoukville is a great little tropical getaway. 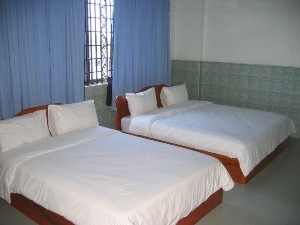 Sihanoukville is a great place to unwind and enjoy the beaches. 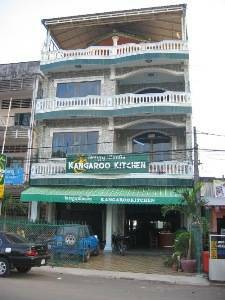 We are conveniently located right in town approx 100 metres from freedom hotel on Street 109 Sihanoukville, just look for the Aussie kangaroo. The small Sihanoukville Airport is located 17km to the east of town, on the edge of Ream National Park. However, the airport's only scheduled service, between Siem Reap and Sihanoukville on PMT Air, has been suspended after a fatal crash in June 2007. The runway is very slowly being extended and international flights may be offered in by the end of 2008. From Phnom Penh: National route 4 from Phnom Penh to Sihanoukville is one of Cambodia's best roads. There are regular bus services with Sorya and GST from Phnom Penh (Central Market) which takes about 4 hours at a cost of 16000 Riel, or US$4. 50 through a guesthouse. The first bus leaves at 7:15 AM, the last one at 2:30 PM. All buses arrive and depart from the bus station worth reserving the day before or at least a few hours in advance to be sure of a seat. Mekong Express also runs two buses a day for US$6, . From Koh Kong / Hat Lek (border crossing with Thailand): for the most part this road is unsealed and the condition depends on the weather and frequency/scale of maintenance. "Local" and "Tourist" minibuses service this route; they are always jam-packed, and the trip can be uncomfortable. "Local" service price depends on how much space you want (a whole seat, half a seat, or a space on the roof); foreigners can expect to pay around US$6-8. Rith Mony bus co. and Virak Buntham Express operate a daily minibus service. The journey involves four ferry crossings; the scenery is mixed, but does offer some moderately spectacular views at the Koh Kong end. A chartered taxi from Phnom Penh's Central Market can do the trip in less than three hours and will cost anywhere from US$25-40, depending on the gas price of the day and how beat up the vehicle is. You can reduce the price by sharing seats, but be warned that Khmers will squeeze in as many six people into the car, so most people will need to buy two seats for comfort. From Koh Kong / Hat Lek (border crossing with Thailand): weather permitting, a daily fast ferry departs from Koh Kong for Sihanoukville at 08:00 and from Sihanoukville for Koh Kong at 9. 30. The journey usually takes about 4-4. 5 hours and stops once to pick up/drop off supplies at an outlying island; tickets for foreigners cost US$20 (or 700 baht). Minibuses and moto-taxis shuttle passengers from the ferry to the border crossing; a moto-taxi should cost 50 baht. On the Thai side, minibuses run to Trat(110 baht) where it is possible to connect with the Thai public bus system, direct to Laem Ngop (for ferries to Ko Chang), and direct to Bangkok, Pattaya etc. There are no longer any passenger services on the Phnom Penh to Sihanoukville railway line. It may be possible to hitch a ride with the freight train security guards - enquire locally for further information. Central SihanoukvilleDistances between the beaches are a little too long to walk comfortably, but getting around is easy, as the roads are wide and bike taxis (motodop) are everywhere. 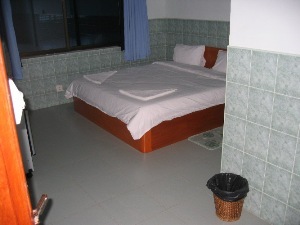 The standard price is US$1 per trip, although expect to haggle at night or if the distance is long. They'll gladly pile on two people and their luggage too. For larger groups, car taxis can be called up by phone (flat US$5 to most places around town) and there are a few tuk-tuks lurking about too.